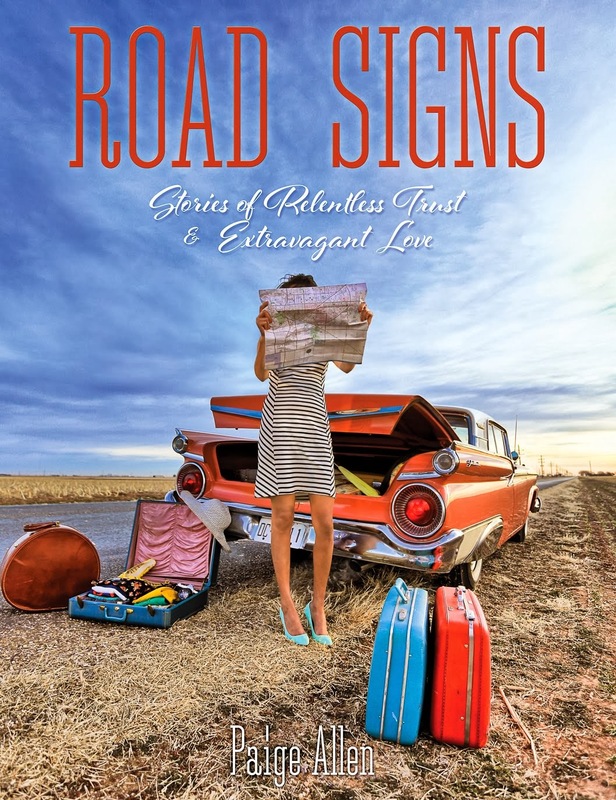 I was beyond blessed last week at the amazing support and love shown to me as I announced that my first Bible study, Road Signs, was being self-published! I had so many friends share this exciting news on social media, that my blog announcement quickly became my most visited blog ever (with the exception of this blog here - apparently people really want to know how to throw a Yo Gabba Gabba party)! Well the excitement is continuing at my house as we received the printed books this Saturday! My girls were thrilled (not sure if they were thrilled about the book or the myriad of boxes that make a great climbing apparatus), but I'm taking their enthusiasm and going with it! There really is just something amazing about holding in your hands the tangible product of being obedient to the Lord. And if I'm honest, this is what fills my heart with the most joy. Have you ever had something in your heart (a project, a person who you know you should call, a desire to travel to the nations, etc.) and it lingers - for days or years? That is what this Bible study has been for me - a thought...an idea...a passion - that would NOT GO AWAY! Regardless of how I procrastinated or tried to tell my heart that my voice did not matter...that gnawing inside remained...until I obeyed. The obedience amounted to hours of writing, rewriting, studying, and fighting the lies that I should stop. Obedience is rarely seen by anyone. It is a lonely path that requires sacrifice, but as I held this book in my hands on Saturday, I realized that obedience is what fills the heart with joy and purpose! Obedience is good. Whether it's obedience to love and raise my kids the way I know I should when another route would be easier. Or when it looks like keeping my mouth shut when I really want to gossip - obedience is always better. It may be hard, but it is good; and the rewards of obedience last a lifetime. So, as I held the product of overdue obedience in my hands, I was filled with thanksgiving and joy. I danced around the house with my girls, and then we promptly got into the car and I mailed off all the books that had been purchased online last week - THANK YOU! For those asking, it is not too late to come to the live teaching sessions that are on Tuesday nights. We had over 70 ladies show up this past week, and I would love it if we reached 100! It was a really fun night - I loved watching ladies connect as they shared their "Jump Out of the Boat" stories. Also for those inquiring, you can go ahead and purchase your Road Signs Bible Study right here on my blog. If you scroll up to the top of this page, you will see page links (Home, About, Etc). If you click on the page link titled "Road Signs" you will be taken to a new page where you can place your order. And I'm continuing my fun deal: if you purchase 5 or more books the month of February, I will send you the DVDs or free once they are ready for release. So please consider buying a Bible study...but don't worry - if I still have them hanging around my house, Haven has made really good use of them! favorite line - "...but I'm taking their enthusiasm and going with it!" This is such a fun season for you - really like the pics of your little ones. Books, books, and more books! I'm glad you fulfilled your dream. Also glad you've chosen to share your dream with others!